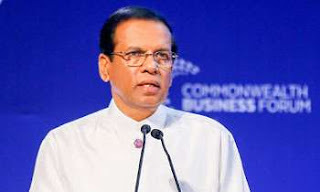 Delivering the keynote speech at the Commonwealth Business Forum held in London, President Maithripala Sirisena highlighted that all stakeholders must work together to eradicate poverty, address climate change and to build peaceful inclusive societies. practices that will promote social responsibility and ensure social inclusiveness,” he said. President Sirisena said good business practices would be a catalyst for peace and good governance and it should reflect social responsibilities and uphold the rule of law with zero tolerance on corruption. In the speech themed ‘Delivering Sustainable Development Goals (SDGs): Aligning Businesses, Societies and Governments,’ President Sirisena said in 2015, the world came together and agreed upon a common vision for a sustainable future in adopting the 2030 Agenda for Sustainable Development. “The Plan of Action we agreed upon is inspiring. Therefore, it is very important that we give life to this ambitious development plan all the way through its successful implementation. In order to eradicate poverty, to address climate change and to build peaceful inclusive societies, it is agreed that key stakeholders must come together,” he said. He said the Sri Lankan Government created a special ministry for sustainable development, integrating the SDGs to the overall national policies.